Celebrate 21 years of life with this personalized 21st birthday t-shirt. 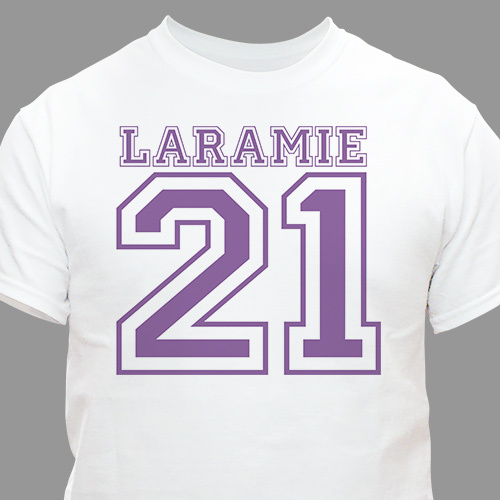 Our Sports Birthday Personalized Shirt is available on premium white 100% cotton. Each shirt is machine washable and comes in adult sizes S-3XL. Also available in Ash Gray or Pink if you'd prefer. Personalize with any age and name. Choose from among 10 colors for printing. Excellent fabric. The print was exactly what I requested, and compared to other sites the price cannot be BEAT!!! This will be a gift so don't know what the person will think, but I think it came out beautiful. It's identified as a "sports" t-shirt, but looks like any other t-shirt.